one crumb at a time: Trifling Matters, or when is a trifle not a trifle? Trifling Matters, or when is a trifle not a trifle? Photography Petrina Tinslay. Recipe published in delicious, May 2006, p. 136. Christmas morning, that is the morning of 25 December, always sees me putting the finishing touches to a trifle, which involves simply putting the various pre-prepared components together in the right order. And as I do this I think about my mother because I always make a trifle the way she did and I wonder where the whole trifle thing came from. The historical background has been traced in some depth by Helen Saberi and Alan Davidson ('Whims and Fancies of a Trifle-Lover' by Helen Saberi in The Wilder Shores of Gastronomy, Ten Speed Press, Berkeley 2002 and Trifle by Saberi and Davidson, Prospect Books, 2009). In its present form the trifle has come down to us via the 'fool' which is essentially flavoured cream and the syllabub which is basically cream flavoured with wine and whipped to a froth. The biscuity or cakey base and custard come in to the picture from the mid-eighteenth century. 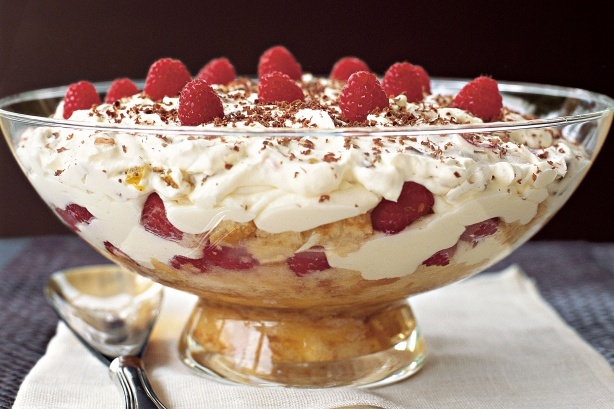 According to The Oxford Companion to Food the trifle is a 'traditional English sweet or dessert. The essential ingredients are sponge cake soaked in sherry or white wine, rich custard, fruit or jam, and whipped cream, layered in a glass dish in that order.' Jane Grigson in English Food confirms the details of what seems to be the 'traditional' English trifle. Her recipe for 'a pudding worth eating', calls for macaroons, soaked in a mixture of 'Frontignan, Malaga or madeira wine' and brandy, covered with a custard made with cream and eggs and thickened with rice flour. Once the custard is cool and firm it is spread with a layer of raspberry jam. The finishing touch is a layer of syllabub, cream flavoured with, in this case, white wine or sherry, brandy and lemon, whipped up into a froth. A search through my cook books certainly confirms that recipes for trifle are likely to be few and far between. It also confirmed that there is some consensus as to what constitutes a traditional trifle. Both Mrs Beeton and Eliza Acton require a base of sponge cake or sponge biscuits, ratafias and macaroons soaked in sherry or wine and brandy, a rich custard, syllabub and cream. 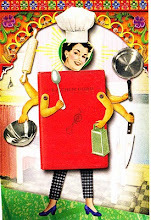 Nothing much has changed by the time we get to my mother's first cookery books, the first edition of Good Housekeeping 's Cookery Book (1948) and Cooking with Elizabeth Craig (1947). Both of these publications call for sponge cake spread with jam soaked with sherry and/or brandy, custard and whipped cream. Elizabeth Craig calls for macaroons and ratafias in the cake layer, Good Housekeeping uses macaroons in the trifle and ratafias for decoration, similarly shredded almonds are a component of both, and the Elizabeth Craig version is decorated with glacé cherries and angelica. Good Housekeeping also has recipes for a Banana Trifle (containing bananas of course and decorated with cherries, angelica and chopped pistachios), Cherry Trifle (with both cherry jam and stewed cherries and made with either sponge cake or cake crumbs) and Pineapple and Ginger Trifle (using tinned pineapple and preserved ginger and custard made from custard powder). The Good Housekeeping Cookery Book of 1985 uses a Victoria sponge, raspberry jam and macaroons, sherry, custard, cream and flaked almonds and glacé cherries for decoration. The Silver Palate Good Times Cook Book (1985) includes a recipe for 'Old English Trifle' which requires Sara Lee pound cake and raspberry jam, amaretti crumbs, marsala, custard, almond flavoured cream and almonds for decoration. That there is some discrepancy between what the recipe books would have us believe is 'traditional' and what cooks actually produce in their own kitchens is demonstrated by comments such as Jane Grigson's when she compares her recipe to 'the mean travesty made with yellow, packaged sponge cakes, poor sherry and powdered custards' and derides 'the brassy effect of angelica and glacé cherries'. Similarly Simon Hopkinson and Lindsey Bareham in The Prawn Cocktail Years insist on 'decent' sherry and preferably amaretti or macaroons/ratafias but definitely not 'shop bought' sponge cake. For them 'jelly is an abomination' and fresh fruit too tart and 'somehow alien to the confection'. And that there is on-going debate about what constitutes a real trifle is born out every year by articles such as this one or this one which claim to set down the rules for trifle making. I don't know where or when my mother learnt to make trifle. She came to Australia from England in her early thirties – did she make trifle before she came here? Surely she must have done. Did her mother use ratafias? Did my mother remove any trace of almonds from her trifle because she didn't like the flavour, because my father didn't or because I didn't? Certainly a trifle was part of most celebrations. I can't remember a time when it was not an integral part of Christmas. I also can't remember a trifle that didn't involve shop bought jam sponge roll – preferably the little rollettes. The cake layer was flavoured with sweet sherry in the early days but became more sophisticated when Mum started using Marsala – did she learn this from Robert Carrier and his Great Dishes of the World? (Somewhere along the way we also discovered that Marsala was terrific poured over vanilla ice cream). In our trifle the next layer is always canned fruit, two fruits to be exact. Did my mother discover two fruits (that is a mix of diced peaches and pears) before she came to Australia? Was this considered some sort of delicacy in post war Sunderland? I doubt that she would have encountered two fruits in her mother's kitchen in Little Eaton. On top of the two fruits, abomination of abominations, comes a layer of Port Wine jelly. The jelly is set separately and then broken up with a fork and spread over the fruit so that it forms a discreet layer and doesn't soak in to the cake – now that would be an abomination! Other flavours of jelly are acceptable but not quite right. I don't remember that she made packet jelly at any other time or for any other purpose. I do remember that my mother was quite capable of making her own aspic and jellied beetroot so using a commercial packet jelly was a conscious decision. Was it too hard to get the right flavour starting from scratch? Then comes the custard. My mother always made the custard using custard powder. Again it wasn't that she didn't know how to do it any other way. She made sensational egg custard tarts and custardy puddings but runny custard was always made with custard powder. Trifle custard was always made with custard powder, slightly more than recommended on the packet so that it was very thick. Once set the custard was broken up with a fork before spreading over the jelly and for special occasions whipped cream was mixed through. I always make custard for trifle with custard powder. The final layer is whipped cream. In the past my mother decorated her trifle with 'brassy' cherries and angelica. We thought it was ambrosia. The only real variation I have made is to eliminate both the cherries (because not everyone likes them) and the angelica (because it has become increasingly hard to buy, and anyway angelica on its own would be a bit silly). How my mother came to this final pinnacle of perfection I will never know but I make trifle the way she did. That is the way my family like it, that is the way our extended family like it. I am the reigning family Trifle Queen and this is the trifle I make every Christmas. I make no excuses for its rather plebeian ingredients. A trifle is not to be trifled with – other layered desserts are trifles in name only. I think a trifle should, as the name suggests, be something light or trivial, it shouldn't take hours to prepare and cost a fortune to make. But made with care the end result is so much more than the sum of the individual components. A mere trifle becomes something special to share to celebrate the moment and commemorate the past. Note: Cassata Trifle is not a trifle if only because it is made with savoiardi not sponge cake, and contains fresh raspberries and ricotta. Anything with chocolate, even if only grated over for decoration, is not a trifle. 'Cassata' and 'trifle' are two words which do not belong in the same sentence let alone the same title.